Assosciated professor Eddy M. van der Velden, MA, RD, DDSD. Born in the fifties in Rotterdam. The development of what has come to be termed ‘dermatography’ over the past 25 years could only be accomplished by the opportunity to attend the teachings in classical tattooing techniques (1980-86) of Mitsuaki Owada (Horikin I), an artisan in Japanese traditional body art, and of professor Tadashi Iizawa. After the completion of these studies the honorific title of Horikin III was received. Van der Velden has performed over 54.500 dermatography and over 7.600 keratography treatments since 1980. 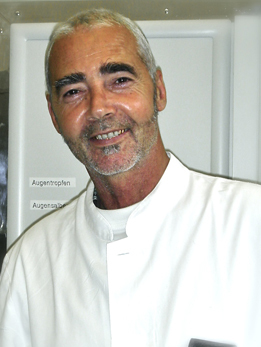 He has been practicing and conducting research of the applications of dermatography in several medical disciplines, at departments of cranio-oral-maxillo- and facial surgery, plastic and reconstructive surgery, ophthalmology, dermatology, oncology and urology in several hospitals (see below), and recently at the Brain Research consortium for Advanced Interdisciplinary & Innoative Neuromudulation. Gent, Dunedin school of medicine, University of Otago, New Zealand BRAI3N, where he is performing studies on new therapeutical applications of dermatography. ● Clinic for Medical and Esthetical Dermatography, Arnhem, the Netherlands (1984-present ) . ● Director Research Institute for Experimental Dermatography ( 2010-present ) . ● Delft University of Technology, Faculty of Electrical Engineering, M&CS Electronics Research Laboratory Biomedical Electronics Group ( 2009-present ) . 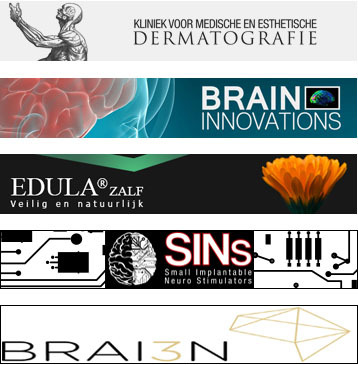 ● Brain Research consortium for Advanced Interdisciplinary & Innoative Neuromudulation. Gent, Dunedin school of medicine, University of Otago, New Zealand BRAI3N, (2005 - present) . ● AZ Monica and Klina, Antwerp, Belgium dept. Cranio-Oral-Maxillo and Facial surgery ( 1992 - 2015 ) . ● Tilganga Eye Centre, Kathmandu, Nepal (1995-present ) . ● Barzilai Medical Center, Ashkelon, Israel. dept. Plastic and Reconstructive Surgery. The Faculty of Health Sciences, Ben-Gurion University of the Negev Beer-Sheba, Israel. Dept. of Plastic and Oral-Maxillofacial Surgery (1993-2015 ) . ● Ludwig Maximilian University Munich, Germany, dept. Ophthalmology (1996-present ) . ● The Eye-hospital Rotterdam,The Netherlands Cornea dept. (1995-2008 ) . ● Academic Medical Center (AMC) Amsterdam, the Netherlands dept.Ophthalmology (1990-1994 ) . ● Academic Hospital Dijkzigt (Erasmus MC) dept. Dermato-Venereology, and dept.Plastic and Reconstructive Surgery, Rotterdam, The Netherlands (1988-1996 ) . ● Universitary Medical Center ( UMC ) Utrecht, the Netherlands dept. Maxillofacial and Oral Surgery (1986-2006 ) . ● He is a visiting lecturer at the Surgery Specialist Course of the Dutch Surgery Society (1997-present) . ● Contributions as an co-author in international medical and technical journals with the SINs group ( Small Implantable Neuro Stimulators ), 9 articles ( 2010-present) . ● He is a Global authority and researcher in Pre-Historic /Paleontology and Forensic Medicine. ● More than 391 Lectures worldwide about Dermatography /Keratography. Additionally, Van der Velden commenced training ophthalmologists in 1996 to treat leucoma cornea patients by means of keratography (medical eye tattooing) . This procedure enables the often young patients to get rid of the stigmatizing effect of a discoloured cornea, thus enabling them to resume a decent existence in their society. At present between 75 and 125 keratography treatments are performed anually, with the Van der Velden Foundation providing the necessary medical supplies. ● Member of the World Intellectual Property Organization (2000-present) .